The email address used to set up the donation account was [email protected]. Last edited by _Will_; 10-29-2012 at 09:08 PM. 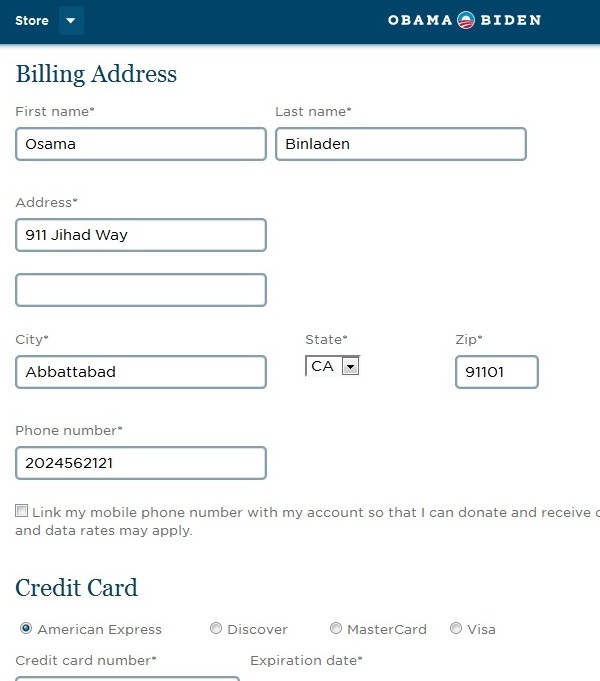 Did they try to donate to Mitt? Ooops - they don't all do it. Hilarious story. They have no filter of any kind and openly stalk citizens (such as myself... sorry I keep bringing this up but I have received 18 emails begging for handouts so far) to donate. I almost wanted to... there's also a "grand prize" of getting to meet obama. Trolling in real life has never been so tempting. I'm sure if I trolled him proper I'd end up in some dank prison getting waterboarded though. NOT ONE LIB HERE will decry this lawless regime. NOT ONE. Dave1, do you regret voting for obama yet? I posted in 2008 that donations could be made from the UK (a friend tested the process), but forum libs said I was a liar. If it is illegal who is responsible for following up on it? Holder's gang? Chicago style campaign funding at its finest. I remember all this. I'm just wondering who is responsible for putting the brakes on it? I suspect it is his crew. If the GOP had any *****, they'd make a huge stink about this. Of course they don't. And as those responsible for investigating and prosecuting this work for The Communist In Chief©, squat will happen from that side either. Thanks for the clarification. I also agree with your last sentence. Bill Clinton started this when he took money from the Red Chinese Army. The "both sides do it" guy is no where to be found. now this is what i call "spiking the football"
The DOJ will need to double in size to prosecute all these Obamaites when Romney takes office in January. I fully expect a mass burning of records and destroying of hard drives between now and then.